Use these recipe writing tips as you write and share recipes on your blog, as a submission to a website, or with family and friends. As always, it is best to write what you know. That’s why it’s helpful to have tried your recipe a few times (or more) to confirm ingredient amounts and best ways to prepare it. Plus, you’ll have extra tips you can share from your experience. 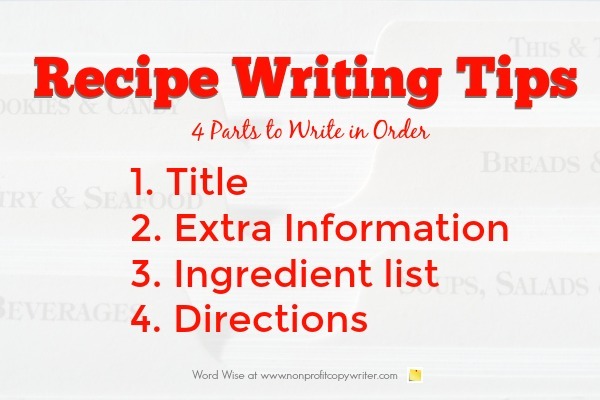 A clearly-written recipe has 4 parts. When to be literal: If you’re writing out a recipe that has a history – whether it’s been passed down in your family for generations or is well-known or pre-published – then be true to the recipe’s given name. When to be creative: If the recipe is your own creation or a variation of another cook’s, then this is the moment in recipe writing that you can be creative. Give it the name you prefer. This section is optional, but can include number of servings, serving size, time needed to prepare the recipe, nutritional information, and even a shopping list. Use these recipe writing tips as you put together the ingredient list. Write out each ingredient in a vertical list. Give each item its own line, rather than writing items in a series with commas in between each one. List the ingredients in the order they are used to prepare the recipe. List total amounts. Record the total amount of an ingredient when is used more than once in a recipe, then add "divided" – as in “2 cups of granulated sugar, divided” where a crust calls for ½ cup and the filling calls for 1 ½ cups. The exception to that is when the recipe has a large number of ingredients, create headings for ingredients of the different parts of the recipe. A layer bar cookie recipe, for instance, may include separate ingredient lists for the crust, filling, and glaze. Spell out measure volume. Use cup rather than c; tablespoon rather than tbsp. or Tbsp. Avoid writing two numerals in successive order. For example, “1 6-ounce bag of chocolate chips” could be mis-read as “16-ounce bag of chocolate chips.” You can skirt this problem when you write out one of the numbers – “one 6-ounce bag of chocolate chips” – or when you use parentheses – “1 (6-ounce) bag of chocolate chips”. Capitalize. Capitalize ingredients that don’t begin with a numeral. Use these recipe writing tips as you put together step-by-step instructions for preparing the recipe. Write the steps in order. List directions in the order they should be carried out. Write each step in a separate bullet or paragraph. Delineate each step with a separate bullet point or number. Separate parts of the recipe. Create headings for instructions for the different parts of the recipe. A layer bar cookie recipe, for instance, may include directions for the crust, filling, and glaze. Specify serving directions and storage directions. Tell your reader what to do when the recipe is ready: Serve cold. Cut into 4 rows of 5. Store with waxed paper in between layers. Keeps for 3 days in the refrigerator. If you copy another cook’s recipe word for word, be sure to get permission and give attribution. If you adapt another cook’s recipe with a few of your own twists, then include an “Adapted from …” attribution on your recipe. If you change it substantially, then include an “Inspired by …” attribution. Christian Writers Market Guide: Do You Need It?